If you are a millennial or have a millennial living in your home, you are no doubt aware that teens are using their creative talents to ask the most important question in spring..."Want to go to prom?" Gone are the days of simple hallway conversations between classes and passed notes from your best friends. Our kids are finding more and more innovative ways to entice each other to prom. The good news is that Duck Brand, marketed by ShurTech Brands LLC, celebrated this new trend by awarding three winners $1,000 for their promposals! Duck brand invited students to use the vibrant assortment of Duck Tape® colors, designs and crafting tapes – as well as its original silver – to create their fun and unique promposal, and then share their stories on social media for a chance to win one of three $1,000 prizes to help offset the costs of prom. 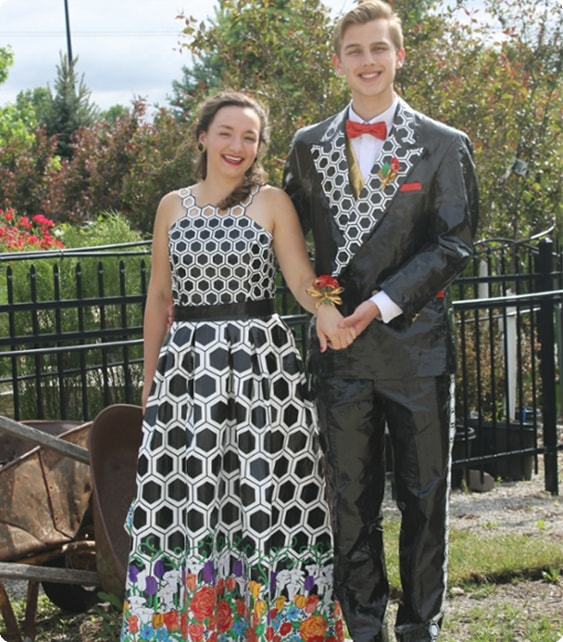 High school students posted a photo entry via Twitter or Instragram using hashtags #DuckTapePromposal and #Sweepstakes, Winners were chosen at random and just announced. FindTape.com offers over 35 unique Duck Brand duct tapes for all of your most colorful and special projects. Low prices, fast delivery and easy shopping. Good luck...and we hope they say YES!